Americans are hearing more about the Common Core State Standards and most of them don’t like what they’re hearing, according to a national opinion poll released Wednesday. Sixty percent of adults said they oppose Common Core, according to the results of the annual PDK/Gallup Poll of attitudes toward public education. That’s a big change from last year, when two-thirds of Americans had never even heard of the voluntary standards that have been adopted by California and the majority of states. This year, 81 percent of Americans told Gallup that they were aware of the standards, with 47 percent saying they knew “a great deal” or “a fair amount” about the standards. Among those who opposed the Common Core, the largest source of opposition stemmed from a belief that the standards will limit teachers’ ability “to teach what they think is best,” followed by a belief that teachers don’t support the standards, the results show. Republicans showed the highest opposition – 76 percent – with 38 percent of Democrats saying they oppose the standards. The Gallup Poll results mirror results of similar recent polls that show that many have a negative – and sometimes conflicting – impression of Common Core. A June poll by Policy Analysis for California Education found that more California voters had a negative view of Common Core than had a positive one. And a separate national poll released Tuesday by education journal Education Next found that support for the standards is slipping, from 65 percent in 2013 to 53 percent. 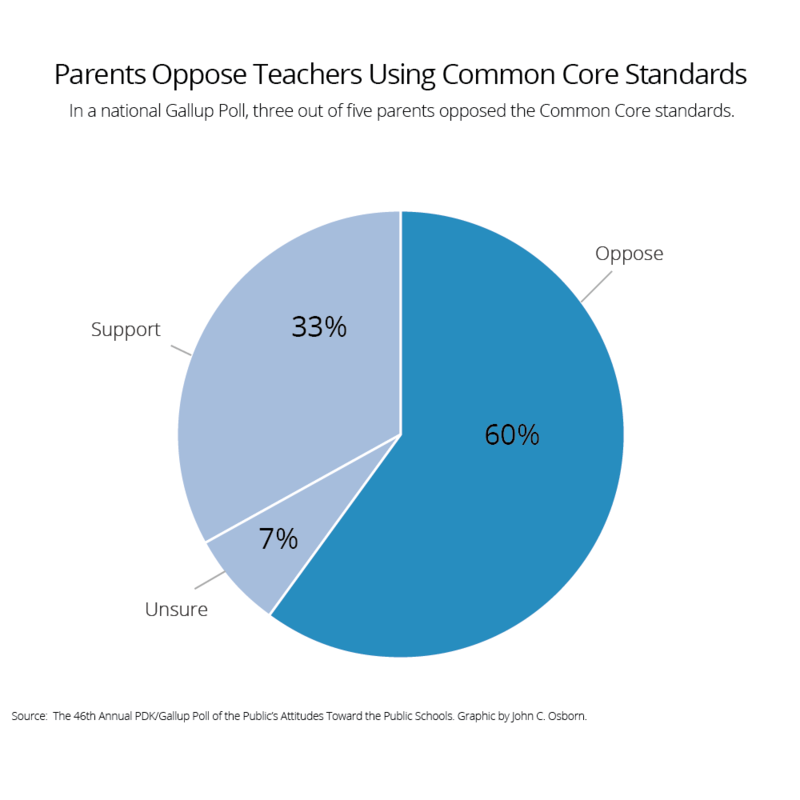 However, that poll also suggested that much of the opposition was driven by reactions to the label “Common Core,” rather than opposition to the overall concept of common educational standards. “When the Common Core label is dropped from the question, support for the concept among the general public leaps from 53 percent to 68 percent,” Education Next reported. The annual PDK/Gallup Poll, now in its 46th year, is the longest-running survey of public attitudes toward education. It is based on results of a telephone survey of 1,001 adults 18 and over; the margin of error is plus or minus 4.6 percentage points. Individual state reports were not included. Originally adopted by 45 states and the District of Columbia, the Common Core Standards are intended to provide commonality around what students learn in math and English. While the Obama administration supports the standards, states’ use of them is voluntary. But the standards have come under fire across the nation and several states have since reversed course on using them. “It’s not surprising that we find as people get more aware of the details and as implementation begins that there are problems that arise that give people a chance to think about whether they are as supportive as they perhaps were when it got started,” said Michael Feuer, dean of the Graduate School of Education and Human Development at George Washington University. Terry Holliday, the state commissioner of education in Kentucky – the first state to adopt Common Core – said much of the opposition stems from a convergence of concerns over waivers to some provisions of the No Child Left Behind Act, as well as attempts to tie teacher performance evaluations to standardized test scores. Those issues “have led the public to connect the Common Core with somewhat of a federal overreach into education,” Holliday said. “The rush to implement the standards has also led to inadequate support of teachers, inadequate communication with the public and a major pushback, I think, from teachers who have connected Common Core with standardized testing, which is connected to their evaluations, and they really question the validity and reliability of that practice,” Holliday continued. Education leaders in California remain committed to the standards, which are supported by the California Department of Education and the State Board of Education, the governor and Legislature, and organizations representing parents, teachers and school boards. The Gallup Poll results come as the California Department of Education on Tuesday launched a “Common Core Toolkit” for educators to use to help explain the new standards to parents and the public. The online database “is a collection of research, recommendations, and sample communications designed to help educators increase their own and the public’s understanding of the kinds of instruction, testing, and support needed to fulfill the potential of the Common Core,” according a news release announcing the effort. Educators can learn more about the toolkit in a series of webinars planned for Aug. 27 and 28. The Common Core results were among the highlights of a Gallup Poll that also revealed a growing dissatisfaction with President Barack Obama’s educational policies and an overall positive view of local schools and school boards. The survey also showed that a majority of Americans support the idea of charter schools, even if they don’t fully understand how they operate. More than 60 percent of respondents said they favored the idea of charter schools, yet large numbers of respondents said they thought charter schools were private and that they could teach religion and charge tuition. As in past years, lack of financial support was identified as the “biggest problem” facing public schools. A majority of adults (56 percent) feel that local school boards should have the greatest influence over what is taught in public schools. Respondents are generally supportive of standardized tests that gauge college readiness, such as the ACT and SAT, but 54 percent said they don’t believe standardized tests in the classroom give teachers useful information about what to teach their students. This appears to be very similar to polling from a whole ago that showed a majority of people opposed to “Obamacare” while, simultaneously, a majority of people were in support of the Affordable Care Act. So the copyright allows you to use the content of the Standards to “support” the Common Core State Standards Inititiative. But the copyright does not allow you to use the content to “oppose” the Initiative. If opponents of the Common Core refer excessively to the actual content in opposing the Inititative, have they violated the copyright that appears to allow only cheerleading? Should they expect a visit from the FBI for the federal criminal offense of copyright violation? Andrew, that’s any interesting perspective on CCSS and something as yet undiscussed here on Ed Source. Have the Feds gone after anybody to date? I doubt it. Imagine the blowback if the Feds prosecuted a CCSS critic. Chuckle, I scanned your email for signs of opposition to common core to see if we need to send the FBI after you, Don. There are indeed lots of laws that the Feds are not enforcing, or are selectively enforcing, no doubt including copyright laws applicable to Common Core. Andrew, if you read another recent post “LAUSD Restricts Use of Citations, Arrests” we might consider enlisting students in the protect against CCSS since they will be more or less immune from arrest, according to the Fed’s own School Quality Improvement system.